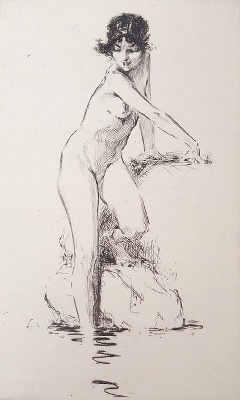 Title: "Sophie Planz in Cleopatre"
Troy Kinney (December 1, 1871 – January 29, 1938) was an American artist, etcher, and author. He was most notable for his works portraying dance performers, fanciful subjects, and classically styled nudes. He worked with dancers, including Ruth St. Denis, Anna Pavlova, and Sophie Pflanz among others. 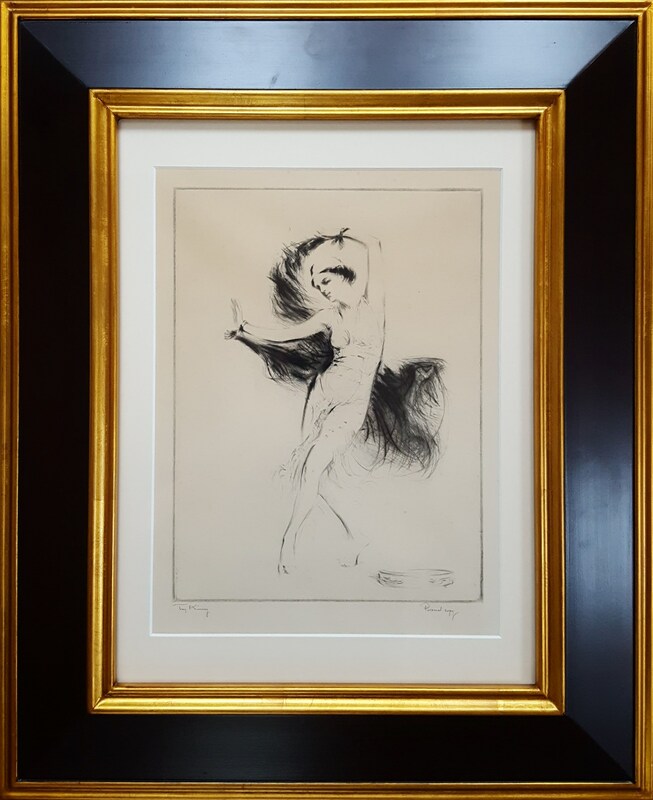 His artistic works are part of the collections of the Art Institute of Chicago, the Cleveland Museum of Art, the New York Public Library, the Library of Congress, and many others. Troy Sylvanus Kinney was born the son of William and Mary Kinney in Kansas City, Missouri. He attended Yale University, graduating in 1896, and then after a brief time illustrating for newspapers in the Baltimore, Maryland area, he moved to study at the Art Institute of Chicago, where he would later become a full member of the Chicago Board of Etchers. He met and in 1900 married his wife and collaborator Margaret West Kinney (1872 - 1952). They were premier illustrators of the early 20th century, creating works together under the name "The Kinneys", including scores of books, and covers for Harper's Bazaar magazine. Perhaps Troy Kinney's greatest legacy is in his contributions in the area of dance. 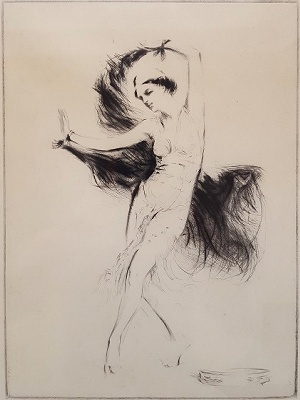 He co-authored with his wife the books "Social Dancing of Today" and "The Dance: Its Place in Art and Life", for which he traveled throughout the world to study various dance styles. It remains to this day one of the most comprehensive works on the subject. 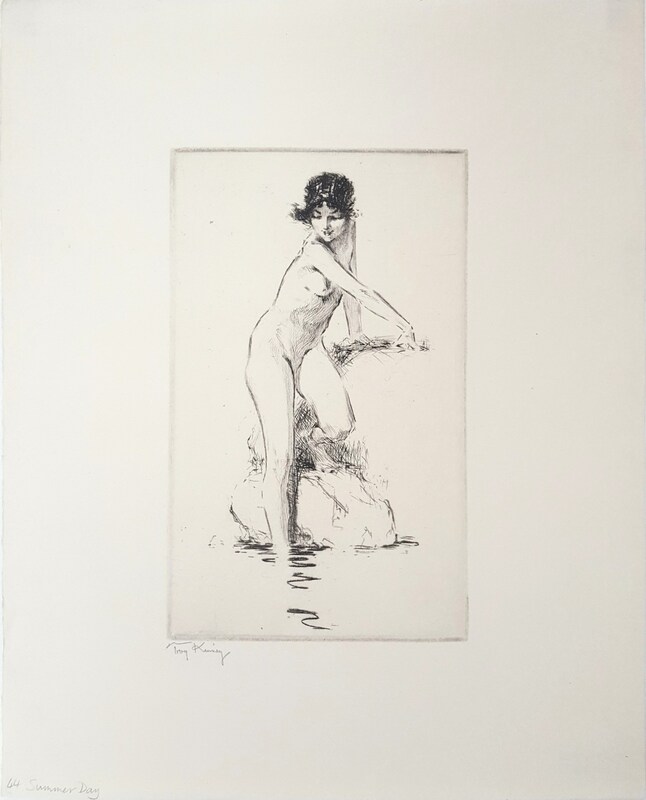 Besides being a member of the Chicago Society of Etchers, Troy Kinney was a member of the Society of American Etchers, and the National Academy of Design. Troy Kinney died near his art studio in Falls Village, Connecticut, leaving his wife and only child, John West Kinney. Sheet size: 11.5" x 9.25"
Image size: 7" x 4.5"